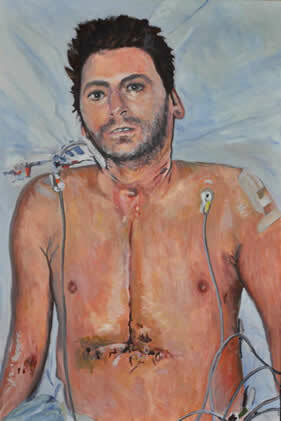 Paintings and photographs by Brian and Bibo Keeley celebrate the co-operative endeavour in the shape of the NHS that saved his life. Aberdeen artists Brian and Bibo Keeley’s “The Shared Heart” is quite literally a life-affirming experience. It celebrates the National Health Service as a vast humane and co-operative endeavour, not a technical or corporate entity. After a massive heart attack, Brian was airlifted to the Golden Jubilee hospital in Clydebank, where he was kept alive on life support. After 101 days in hospital, at the end of 2013 he received a new heart, the start of a life-changing journey. The couple decided to creatively chart that journey together. Bibo photographed Brian and the staff who were supporting him, from intensive post-operative care to the first shaky moments out of bed. Her pictures are both poignant and inspirational. A photograph of Brian with a cross, cut and stitched across his body, recalls a crucifixion scene, precursor to what truly is a kind of resurrection. 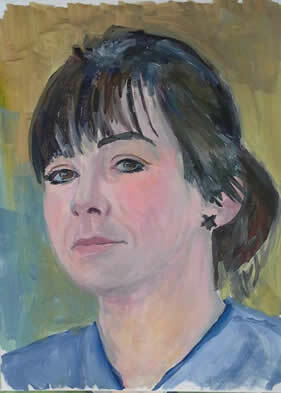 The only self-portrait in the show is based on this image. The photographs are starkly honest, showing moments of despair and exhaustion. But alongside that are photographs of Brian tended to and supported by hospital staff. They all brought their skills together in the shared project of “Brian Keeley’s recovery”. 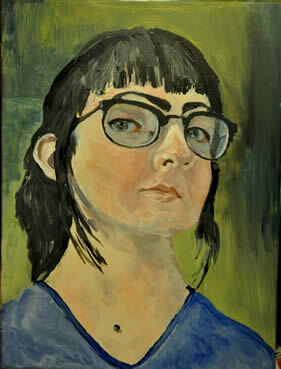 Painting the 25 portraits in this exhibition gave Brian a goal and was a key part of his rehabilitation. He also wanted to fix this experience in his mind forever. The portraits are expressive of great individual character and kindly humour. 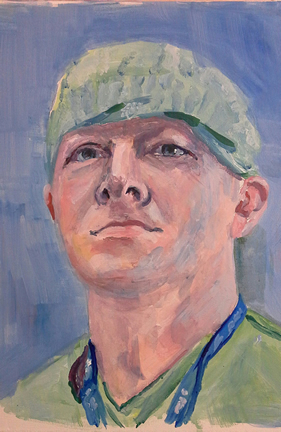 But painted in this way, with the same size and approach for every subject, whatever their job title or NHS trade, you become aware of them as diverse parts of an amazing whole. They could not have known that the portraits based on photographs taken by a patient with trembling hands, along with the photographic record his wife was making, would create this powerful artistic and social statement. What an amazing thing is this NHS that brings together such a diverse cross-section of our society in a shared human endeavour. And this is doubly poignant, because the show opened on the day when the UK woke up to a Tory government hell bent on cuts and privatisation. Bibo’s small ceramic figures are a contrast to the sometimes-shocking realism of the photographs and the humane charm of the portraits. They quietly express the experience of those who sit by the bedside, sharing suffering with dread and hope. 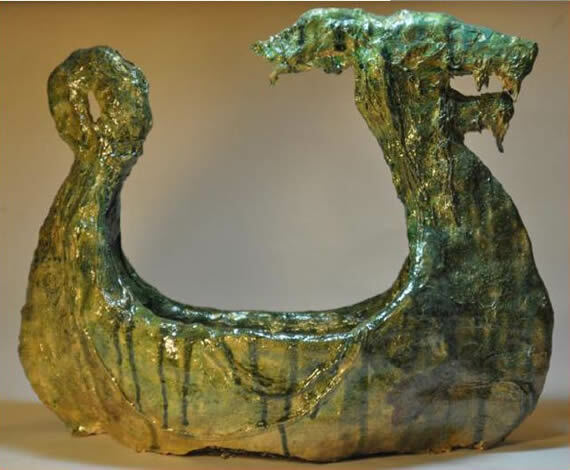 A Viking Funeral Boat is turned into an icon of hope because it holds a cargo not of Brian’s ashes, but of sand from their favourite Aberdeen beach, in the hope that they would one day walk there again. Another small figure is a surreal portrait of her husband. On its shoulder is a terrifying lizard; it is pierced with nails from the back through the heart, and close to its heart it nurtures the head of a pale and lifeless person. As an image, it really packs a punch and gives a sad presence in the show of the person whose heart gave Brian his second chance. The show is on at Art Village (a not-for-profit community venture that deserves a review all of its own). Then it is going ‘home’ to the Golden Jubilee Hospital itself. But it deserves to be seen much more widely, and it is to be hoped that curators from the Scottish National Portrait Gallery are taking note! “The Shared Heart” runs until May 24 at the Art Village, Shawlands Shopping Centre, 104 Kilmarnock Road, Glasgow G41 3NN. Open Tuesdays to Saturdays 10.00am to 6.00pm, Sundays 12.00pm to 4.00pm. Closed Mondays.